Union Minister of state for Parliamentary Affairs Mukhtar Abbas Naqvi slammed the Congress vice president for his remarks against the Prime Minister. 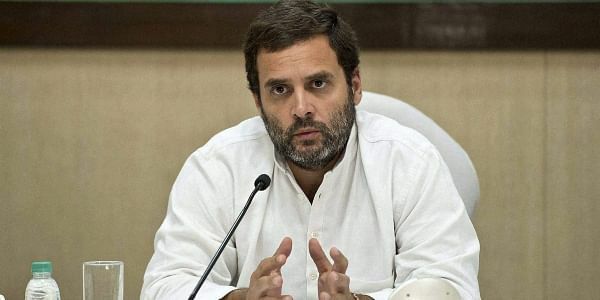 NEW DELHI: After the Congress Vice-president Rahul Gandhi claimed that the Prime Minister Narendra Modi was more interested in “peeping into bathrooms of people”, the BJP hits back at him, saying he "behaves as per his standards". "Everybody behaves as per his standards and BJP does not expect anything better from the Congress leader,” said Union Minister for Human Resources Development Prakash Javdekar. Union Minister of state for Parliamentary Affairs Mukhtar Abbas Naqvi also slammed the Congress vice president for his remarks against the Prime Minister. "He does not talk anything. He talks confusedly. First, he should correct his mental balance to say what he wants to say," Naqvi told reporters while reacting to the statement of the Congress vice president. The minister also quipped that there is a "James Bond" in Congress, who used to spy on Ministers for Home Affairs and Finance in the previous UPA government. Talking about the Uttar Pradesh Assembly elections, Javdekar said that the ruling Samajwadi Party and the BSP are not options for the people. “The BJP is the only right alternative. The BJP alone can do holistic development of the state,” said Javdekar, while adding that the BJP would get a big mandate in the state. The Union Minister also charged the ruling Samajwadi Party government of corruption, as the state's public service commission was embroiled in the scam. “There was discrimination in handing over laptops to students by the SP government,” he alleged. Javdekar also claimed that a BJP survey had shown that the party will win a majority of the seats which went to polls in the first phase for 72 Assembly seats.